When people see fleas on their pet, they want to know only one thing: how to get rid of them. Although flea control today is a good bit easier than it once was, it’s far better to prevent fleas than to have to treat an established infestation. Fleas are tiny brown insects about the size of a pinhead. Their bodies are oval and flattened from side to side. Fleas are sometimes visible on pets. If you try to capture a small insect crawling on your pet and it jumps a good distance away from you, it’s probably a flea. Fleas can be difficult to find if they are present in small numbers or if the pet has been chewing its skin. However, you might see what’s called “flea dirt,” which looks like black dandruff. Fleas are blood suckers, so flea dirt is actually digested blood they have excreted. If you’re not sure if what you’re seeing is flea dirt, brush some of it onto a white cloth or paper towel and add a drop of water. If the wet dirt leaves reddish streaks on the white surface, it’s flea dirt. Fleas can also cause a telltale pattern of hair loss. In dogs, hair loss?on the lower back, tailhead, ?and inner thighs is common evidence of fleas—even if you haven’t seen any of the little buggers. 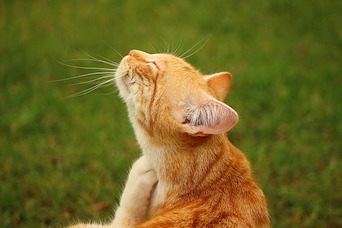 In cats, skin problems may be spread over a wider area of the body, including the face and neck. Fleas are more than just an itchy nuisance. They can actually cause a number of potentially serious problems:? Flea-related dermatitis and flea allergy: Fleas cause skin irritation and infection in any pet that chews at itchy skin. For pets that are allergic to flea saliva, the bite of even 1 flea can cause intense itching and serious skin disease. Signs of flea-related skin disease include redness, bumps, and scabs. Anemia: A heavy flea infestation can cause anemia and even death from blood loss. Infection: Fleas carry bacteria and parasites that can infect both pets and people, including tapeworm, typhus, tularemia, plague, and bartonellosis (cat-scratch disease). Eggs: Fleas deposit eggs in their host’s fur; the eggs then drop into the environment. Larvae: Eggs hatch into larvae (very small, caterpillar-like creatures), which develop in protected areas away from sunlight, like carpet fibers and shaded outdoor areas. Pupae: After a few days to weeks, larvae spin cocoons and become pupae. Pupae can remain stable in their cocoons for months if they do not dry out. Pressure, carbon dioxide (from breathing), and increased temperature all stimulate pupae to develop into adults. Simply walking around a room can trigger the emergence of adult fleas, even if the room has been vacant for weeks or months. Adults: Most adult fleas emerge within a month after pupa formation. They jump onto a passing host and begin feeding right away. Females usually lay eggs within 24 hours. As you can see, flea eggs, larvae, and pupae are lurking in and around your home. Inside, they’re in areas where your pets spend time, such as bedding, carpets, floorboards, and furniture. Outside, they can be found in moist, shaded soil and between joints and cracks in concrete?on porches and sidewalks. Fleas survive best in warm, humid climates. Because these younger life stages continue to develop, more fleas will emerge once you use a flea control product that kills adult fleas. These newly emerging fleas are why you need to use a flea product that has residual activity and to continue using it for several months. You’ll also need to vacuum carpets inside and remove debris from flowerbeds and bushes. The Companion Animal Parasite Council—a group that provides information? about the diagnosis, treatment, prevention, and?control of parasite infections—considers flea infestations to be a public health concern and recommends that pet owners do the following:? Treat all dogs and cats with flea control products year-round for life.? To eliminate an established flea infestation, treat all pets in the home and understand that controlling the infestation could take months. Very effective products are available to prevent your pet from flea infestation, some of which can be obtained by prescription only. Talk to your veterinarian about the best product to use on your pet. If you are considering over-the-counter products, be aware that those containing synthetic pyrethrins, including permethrin, can be toxic to cats. Flea combing is the safest way to remove fleas from puppies and kittens that are too young for flea products.? If your pet does come home with fleas, keep in mind that you might still see fleas after using a recommended product even if you have followed label instructions and treated all of the pets in your home. This does not necessarily mean that the product failed; it takes time for all of the pupae in the environment to develop into adults. Many of these products kill adult fleas before the females can lay eggs, so in time, the flea population will be eliminated because no new eggs are being laid.